Condos were not previously the plan here. It was going to be your standard suburban strip mall. I can't seem to find the old site plan. However that's not the latest one. There was a newer one with more buildings fronting (or rather backing) Bridge. The add just came up on my facebook now.. They still have the pedestrian path along the back of the property! Good to see. Also nice ot see that the buildings are (mostly) street-facing, with parking at the interior! That does assume that street-adjacent buildings are actually street-activated with entryways and visual penetration. If the entrances are all exclusively towards the parking lot (note: all these buildings will have their main entrances there), and no entrances and possibly only opaque/"dead" activity spaces on the street, this is no more pleasant than Kaufman Lofts to be around. The retail component of Building A (Phase 1) appears to interact with Northfield. In the planning justification document two stores front the street. Can't say much about the other condo/apartment buildings for later phases. I would say they do not interact with Northfield, which is a shame. The City really needs to focus on the Northfield & Bridge intersection and this development. It's become a very busy intersection and Northfield needs updating (2 lanes) with proper bike lanes and sidewalks. There is a bus stop right outside of where they want to eventually put a restaurant. IMO those pad-retail buildings should be part of a mixed-use building that helps define the intersection. Retail first floor, residential and/or office above. No update, just catching up on some old threads. Ugh, the relation to the street corner is horrible. This is a surprisingly busy pedestrian area, thanks to the nexus of bus routes that stop here. Pad 1's access from the crosswalk has you fording the grass, squeezing between the bike rack and patio. Pads 2 and 3 don't even have a sidewalk connection, assuming that anyone coming from the bus stop will instead navigate past a gauntlet of drive through lanes. The tower's retail strip should have a continuous, straight sidewalk all the way to Northfield's MUT. Not that absurd curved jog next to the car slip lane. I swear, the people who design site plans have this insane obsession with running sidewalks next to whatever lanes/roads exist, no matter how much it may go counter to actual desired pedestrian flow. See also Waterloo Town Centre's connection to Caroline St next to the ION tracks. This render showed up as an ad on instagram for me. Can't seem to find any more though, their website is still empty as is their instagram page. Interesting. I guess it's this corner as it's the only open area in that intersection. If they are right on the intersection and not back a couple blocks. The entire development is "right on the intersection". The pictured building is not. This render is effectively being shot from across Northfield Dr, at the primary apartment building. They sent out an email to anyone who signed up on their website. There's a few more renders there. 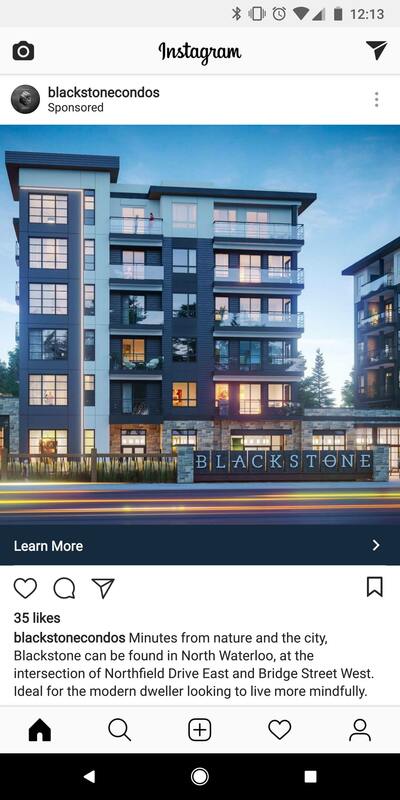 It's interesting to me how there's such a disconnect between branding and the overall design of developments like these. Pad sites and drive-thrus aren't trendy. If I'm in the market for a condo, even if I have a car, I want see the development embrace all modes of transportation. I want to see the condo above restaurants and other businesses so I can walk right down to them without going outside. The bus stop should be engaged with the development, inviting transit users to access the businesses while they wait or arrive. Parking should be underground and/or within a covered building (podium). There's elements to this proposed development that are "ok", but it's not trendy and will only be able to compete with other developments in the core on price. I don't think there's a single example of residential condos in the region where you can walk inside a building to the common elements. They often share some access, but the interior access is never for the public. The closest example I can think of is TBK, but that's a commercial-only condo, and TBK made their only entrance from that shared vestibule. Maybe there's something shared at proof? Regardless, it does restrict the client design options to have two separate entrances, such that it is intentionally discouraging to potential tenants. No restaurant wants to have to staff two host stations because there's a resident internal entrance at one end of the restaurant, and an external entrance at the other end. It also dictates more of your floor plan than you might want to have, limiting kitchen and bathroom options. Give an awning instead I say; the awning at the42 was always sufficient for a quick pop outside to go to any tenant of the commercial units.